Well that's all you need to connect, and all you need to browse with Etisalat, Glo, Airtel and MTN. Please note that these settings are not free net surfing (popularly known as cheat codes), they are the authentic Glo, Airtel, MTN and Etisalat internet settings. So you would be charged, but with Etisalat www.etisalat.com.ng is free, just as www.mtnonline.com is free on MTN. For any further clarification, feel free to ask in the comment. I will give it a try using my Etisalat SIM on my MTN F@stlink. Please keep it up. I will try my best to keep it up. With the internet.ng.zain.com APN the proxy is not needed just as you said. Now I definately know more especially about the glo data service. Plz guy i need etisalat nd mtn internet setting 4 HTC HERM200, pls i need it badly. Sorry for not replying sooner. Goto settings on your android phone and create the following access points. This is all you need to fill. Don't bother about any other settings parameter, like the apn type and proxy. With these three settings parameter above, you're good to go..
Pls what is the mtn code address.. My etisalat modem requires that pls! If your Etisalat modem is asking for a special code, that'll be the unlock code. You'll have to google how to get the unlock code for your particular modem, check the body for manufacturer (Huawei, ZTE...) and model. Pls do these settings still apply currently? Yeah, they still work. I keep them updated and current. 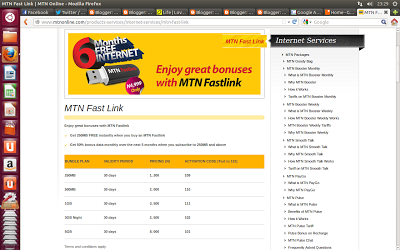 So what's the user name and password when configuring etesilat/9mobile on the Mtn fastlink modem? ?